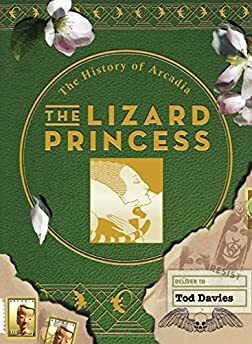 Largehearted Boy: Book Notes - Tod Davies "The Lizard Princess"
Book Notes - Tod Davies "The Lizard Princess"
The impressive The Lizard Princess continues Tod Davies' imaginative History of Arcadia series with her trademark brilliant storytelling. "Complex and gripping. . . . Newcomers to Arcadia will be captivated by the rich history, while those familiar with it will find that Sophia’s legend grants them a new perspective on the earlier tales." When I was writing this third book in The History of Arcadia series, I was doing a lot of driving back and forth between Oregon and Colorado, across the mountains and high deserts of the west. There really is no better scenery to remind one how the outer world is simultaneously a symbol for the inner one, and no better way to listen to music than driving through all that solitude and grandeur. Sophia the Lizard Princess, she who becomes Sophia the Wise, was always along for the drive. And I found that since the book itself ended up as a series of encounters with people Sophia loved, whether she wanted to or not, the songs that said the most to me were the ones that told me more about those encounters. David Bowie, "The Next Day"
This could be Sophia's song, if she wasn't so tenaciously optimistic about a world of evil and suffering being simultaneously a world of wonder and joy. It could be Will the Murderer's song as he contemplates his own evil and turns himself into Wilder the Bard. I used to like David Bowie well enough without taking him too seriously, but this album…this song…blew me away. He's looking right in the face of how reality gets turned into lies for a mass audience, and how you get half killed if you tell the truth. While I listen to it, it seems to me he's part murderer, part murdered, part wizard, part bard himself. Tommy James and the Shondells, "I Think We're Alone Now"
My favorite song when I was a teenager. It still brings back all those scary, edgy, precipice-skirting feelings of teenage love. Brought them back when I was writing about Sophia and her teenage love for my hero, and how she remembers that love from where she's writing, now, at my own much much older age. If you remember that time rightly, you can never do anything else but sympathize with the characters in this song. Another song I never tired of, even after all these years of it being a favorite. It so much talks about the dark you walk right into, as bravely as you can, when you're a girl turning into a woman and feel, without actually being able to put it into words, that to some people you're prey rather than someone to be cherished. It was the perfect song to hear, in my head as well as on the car radio, when Sophia sets out alone, by the Wall of Fire, after an encounter with a father who fails to recognize her as his daughter. Judy Collins, "The Sisters of Mercy"
This Judy Collins cover of a Leonard Cohen song is like a bird singing in the evening. I love his own version, but it's hers that makes me think of Susan, who works to bring the Marsh of Megalopolis back to life from her small wooden house at its edge. Sophia loves Susan without being able to make her understand the differences between their worlds, and I think we all would feel the same about the Sisters of Mercy…if we ran into them soon, didn't turn on the light, and read their address by the moon. "When you're not feeling holy, your loneliness says that you've sinned." Maybe. Maybe not, though. The Left Banke, "Pretty Ballerina"
For some reason—probably because The Lizard Princess is the story of an older but wiser woman looking back at her younger life—while I was writing it, I kept hearing songs from my own earlier years. This little tune is a silly, trivial thing, like a music box tune, and I think it's meant to be that. You imagine the ballerina he yearns for turning and turning en pointe in place forever. As Rowena does, trapped like both the ballerina and the singer in this little pop song, by the limits placed on her by her world. Erik Satie (played by Aldo Ciccolini), "Trois Gymnopédies"
The most beautiful and harmonious and calming songs to hear as you cross a lonely desert road in a thunderstorm. By a surrealist composer dedicated to trying to open up the landscape so that people could see past the bend just up there in the road. Curiously, it makes me think of both the two most kindly people in The Lizard Princess—Amalia Todhunter and Francis Flight—and of the most destructive—Livia: empress, dragon, and the Devil Herself combined. Now why is that? I listened to the pop stations in the towns I passed through in hopes of hearing something new rather than the same old stuff, and I'd almost given up hope when this song came on, and the hair stood up on the back of my arms. She's new, Lorde. If there was ever a song that would be a bit hit in Arcadia, this one is it. It astonished me to read the comments on a YouTube video of the song—hardly anyone seemed to get what it was about. It's so obviously an in-your-face rejection of the whole fantasy view of what rock and roll is supposed to be about. She takes it—so smoothly!—in a whole new direction. A good direction. One Arcadia would be wholeheartedly behind. Chumbawamba, "I'm In Trouble Again"
There's never been a lone cross-country trip where I didn't play all my Chumbawamba albums over and over. I was thinking ruefully to myself that the road I usually take is just about deserted, and was that a good thing or a bad thing, when this song came on—and across the desert, arcing up from the side of the highway, was a full rainbow. I laughed out loud at that, pulled the car over to watch, and as I did, another rainbow sprang up beside it, curving up until there was a double rainbow there. Another car raced past, over the speed limit, and never even saw.